Birth of Harold Gibbons registered June quarter 1898 in Dudley. 44 Regent Street, Woodsetton, Staffs. William Gibbons (39, Coal Miner, born Sedgley), his wife Martha (29, born Sedgley), and their 3 children: Daniel (6, born Sedgley), William (4, born Sedgley), and Harold (3 months, born Sedgley). 35 Regent Street, Woodsetton, Staffs. Martha Gibbons (39, Widow, born Coseley), and her 4 surviving children of 5: Daniel (16, Fender Fitter, born Coseley), William (14, Collier, born Coseley), Harold (13, School, born Coseley), and John (9, School, born Coseley). Harold’s mother Martha was recognised as next-of-kin by the Imperial War Graves Commission. She paid 18 shillings and 11 pence to have the following inscribed onto his gravestone: “He has gone to the one who redeemed him out of night to the splendour of the day”. Harold’s outstanding Army pay of £16/19/1d (16 pounds 19 shillings and 1 penny) was paid to his mother and sole legatee, Martha, in November 1918. His War Gratuity of £5 was also paid to his mother in November 1919. 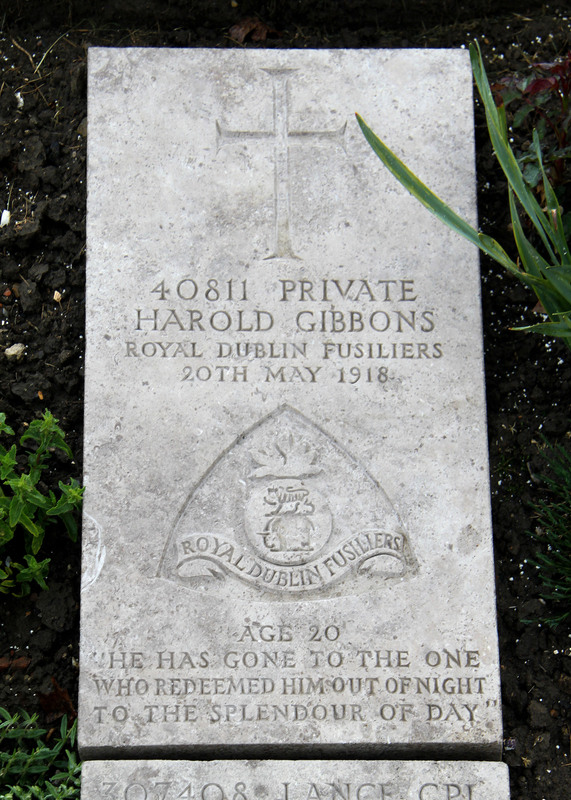 As Harold’s Soldier’s Papers did not survive, we do not know precisely when he joined the 1st Royal Dublin Fusiliers (1/RDF). However a calculation based on his date of death and the amount of his War Gratuity suggests that he joined the army in February 1917, and we know that he was initially in the Training Reserve. During the German 1918 Spring Offensive, the 1/RDF were near Epehy on the Hindenburg Line. The overwhelming German attack forced the 16th (Irish) Division, including the 1/RDF, south-west towards Peronne and then west following the River Somme to the outskirts of Amiens. This retreat of about 40 miles saw 125 men of the 1/RDF killed by the end of March 1918. After re-building their numbers, in late April 1918 the 1/RDF transferred to the 29th Division just as the Battle of the Lys was drawing to a close. They were put into the front line in 1st May on the eastern fringe of the Nieppe forest, near the village of Vieux-Berquin. Minor casualties were suffered over the next week, but it is likely that Harold was gassed whilst out of the front line, having been relieved on 9th May. It is also possible that Harold was wounded on 15th May when another 39 men of the 1/RDF were gassed, we cannot be sure. Mustard gas caused skin blisters both externally and in the bronchial tubes, vomiting and possible blindness. Harold was moved back through the Casualty Clearing system, and on 21st May 1918 he died in one of the many hospitals in Boulogne. Harold is buried in Boulogne Eastern Cemetery.